In this work, the surface of MoS2 particles has been coated with Ni using the electroless plating method as it is relatively efficient and cost effective. Two samples were synthesised, one of them was sensitized using Sn (ultrasonically dispersed for 30 min in a 24-hour aged bath comprising 0.1 M SnCl2 and 0.1 M HCl) and the other was not sensitized. The effect of the sensitization process on nickel coating over MoS2 particle surface was studied. XRD pattern of as-deposited surface of the sensitized and non-sensitized samples shows the absence of Ni phase while the annealed samples confirm the presence of Ni in fcc structural phase along with MoS2 phase. The surface morphology of all samples is observed using FESEM and it is observed that the treatment with Sn forms a uniform coating over MoS2 particles whereas the non-sensitized sample shows an irregular coating of Ni over MoS2 particles. 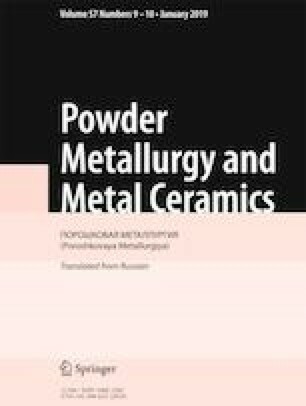 Published in Poroshkova Metallurgiya, Vol. 57, Nos. 11–12 (524), pp. 101–107, 2018. Authors would like to acknowledge IITM, SAIF for FESEM measurement.